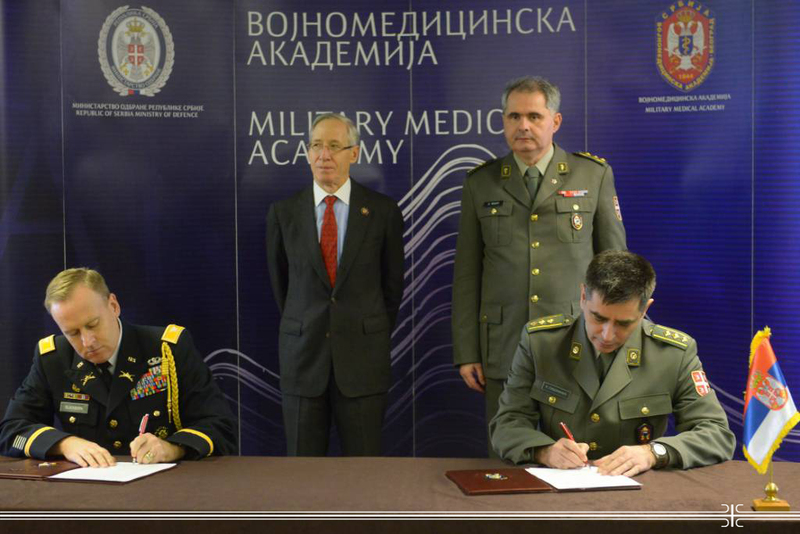 At the Military Medical Academy today, in the presence of US Ambassador Michael Kirby and Acting Head of MMA Col. Prof. Dr Zoran Segrt, an annex was signed to the contract on donation worth 90,000 US dollars. The US donation to MMA consists of equipment for primary prevention of HIV/AIDS and other sexually transmitted diseases, training material for Serbian doctors, rapid tests for sexually transmitted diseases and other equipment intended for raising awareness about HIV/AIDS in the Serbian Armed Forces. Otherwise, it is a global initiative under which the US Government cooperates with the armies around the world, to enhance awareness of these diseases and enforce capacities for their prevention, care and treatment. Ambassador Kirby said that the program was launched in 2006 and that since then the Ministry of Defence and the Military Medical Academy have received through donations from the US Government equipment worth more than 900,000 US dollars. Kirby stressed that the US Government has a long tradition of cooperation with the Serbian Armed Forces and the Military Medical Academy and that the US Government, the European Union and the United Nations are increasingly working to help Serbia increase its deployment in peacekeeping missions around the world, and for the Serbian contribution to these missions to be even better and more valuable. Colonel Prof. Zoran Segrt thanked for another valuable donation. He said that the HIV/AIDS are a globally present problem that MMA has recognized in time. The problem, according to him, is even more significant for us because SAF members are increasingly present in peacekeeping operations around the world, and since 2014 the representatives of the military health system are also the key carriers of medical care in the Central African Republic, where the level 2 hospital is fully under the jurisdiction of the Serbian Armed Forces. "The results we have achieved so far through this program over the last eight years are evident and I hope that we will continue with this program, and I am fairly certain that we will expand our cooperation to other fields of medical cooperation during the next year," said Colonel Prof. Dr Segrt. US Ambassador Michael Kirby also attended the promotion of the book "Sexually transmitted infections and the military population", which was printed with the funds from the previous donation. The monograph is the work of a group of authors from the MMA’s Faculty of Medicine and the Faculty of Medicine in Novi Sad, and editor of the book is Prof. Dr Vesna Suljagic, Head of the Department for the Prevention and Control of Nosocomial Infections.